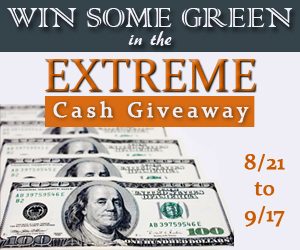 Welcome to the August Extreme Cash Giveaway! Lille Punkin' has teamed up with Oh My Gosh Beck!, Life With Levi, Broward Saves, My Vegan Gluten Free Life, ShopaholicMommy, Coupon For Five and other awesome blogs to give all our readers the chance to win a huge cash prize! Giveaway is open worldwide and ends September 17th at 11:59 PM EST. Good luck!